Mike Daisey returns to tackle our nation’s most intractable subject: America’s relationship with guns. Throwing easy answers and partisan bickering out the window, he delves into the history of the gun and its place in our national culture, cutting through the political static with hilarious comedy, brilliant observation, and pitch-perfect timing. 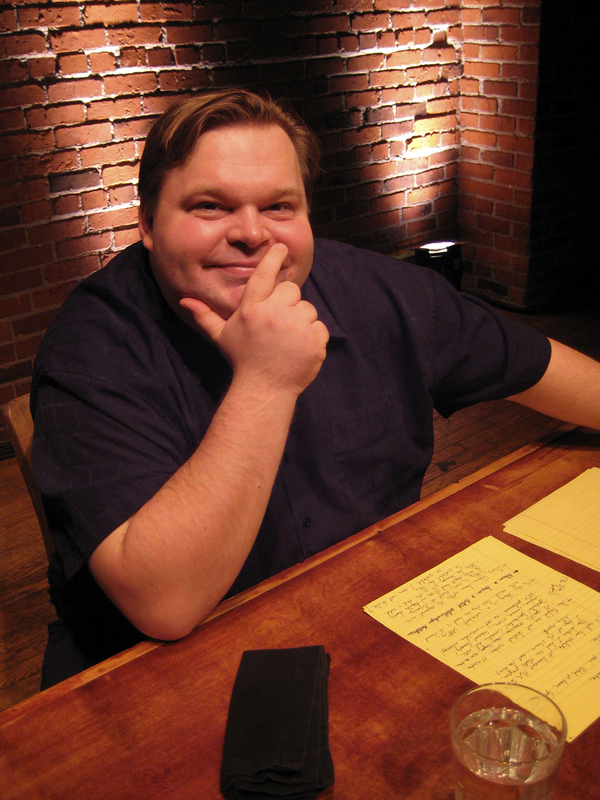 Mike Daisey, who has been hailed as “the master storyteller” and “one of the finest solo performers of his generation” by the New York Times, is the preeminent monologist in the American theater today. He has been compared to a modern-day Mark Twain and a latter-day Orson Welles for his provocative monologues that combine the political and the personal, weaving together secret histories with hilarity and heart. He’s known for art that reinvents the form, like his critically acclaimed 29-night live theatrical novel, All the Faces of the Moon, a forty-hour performance staged at the Public Theater in New York City. He has toured across five continents, ranging from remote islands in the South Pacific to the Sydney Opera House to abandoned theaters in post-Communist Tajikistan. He’s been a guest on Real Time with Bill Maher, The Late Show with David Letterman, a longtime host and storyteller withThe Moth, as well as a commentator and contributor to the New York Times, the Guardian, Harper’s Magazine, Newsweek, WIRED, Vanity Fair, Slate, Salon, NPR, and the BBC. In a brief, meteoric career with This American Life, his appearances are among the most listened to and downloaded episodes of that program’s history. He has been nominated for the Outer Critics Circle Award and two Drama League Awards, and he is the recipient of the Bay Area Critics Circle Award, six Seattle Times Footlight Awards, the Sloan Foundation’s Galileo Prize, and a MacDowell Fellowship. As a playwright, his transcript of The Agony and the Ecstasy of Steve Jobs was downloaded more than 100,000 times in the first week it was made available. Under a revolutionary open license it has seen more than 150 productions around the world and been translated into six languages. Years later, there are productions being staged all over the world every night from Germany to Sao Paolo to mainland China. He is currently at work on his second book, Here at the End of Empire, which will be published by Simon and Schuster, and a full-length thirty-hour theatrical monologue adaptation of Howard Zinn’s A People’s History of the United States. For more information, please visit mikedaisey.com or listen to his free podcast All Stories Are Fiction on Soundcloud or at iTunes. The Story of the Gun runs July 31 through August 5, 2018, with performances Tuesday-Friday at 8 pm, Saturday at 3 pm and 8 pm, and Sunday at 2 pm. In conjunction with The Story of the Gun, acclaimed Swedish playwright and director Paula Stenström Öhman presents a reading and panel discussion on her work, People Respect Me Now, on Monday, July 30 from 6:30 to 9 pm. Written in response to the Columbine tragedy by a dramatist with training in criminology, this piece explores issues of culpability, and asks: are these acts the result of male identities defined by aggression and violence, broken individuals and families, collapsing social safety nets, or something else entirely? Following the reading, we will engage in a facilitated panel discussion with the Stockholm-based playwright, her American counterparts, and policy experts looking to shed light on this complex matter. The reading, discussion, and Ms. Öhman’s visit to the U.S. is supported by the Embassy of Sweden in the USA and the Swedish Arts Council, and presented in partnership with the Theater and Policy Salon. Ticket prices range from $20 to $75. Visit us online at woollymammoth.net, by phone at (202) 393-3939, via email at tickets@woollymammoth.net, or in person at the Box Office, located at 641 D Street NW. Tickets for Woolly’s Pay What You Will performance will be sold through TodayTix. Patrons who are 30-years-old and younger may, at any time, purchase Section B tickets for $20 to any performance. There are also discounts available for educators, first responder men and women and active US military personnel, spouses, and veterans. More information is available at woollymammoth.net.